Let's return to Glastonbury and get our chakras aligned and our auras polished. Glastonbury is Britain's combined Roswell and Haight-Ashbury. Before you conclude it's just leftover 1960s hippies, remember that the Temple of the Stars was dreamed up in 1934, the Chalice Well was getting its yoni symbolism in 1919, lots of supposed local activities of Joseph of Arimathea were first described through the 1800s, and that just added on to all of the Medieval "discoveries" of what Joseph, Arthur and Guinevere were up to through the era of Roman Britannia. There were hippies in the 1860s, too. We're looking north on Magdelene Street toward the Market Place. The entry to the Abbey grounds is ahead on the opposite side of the street. 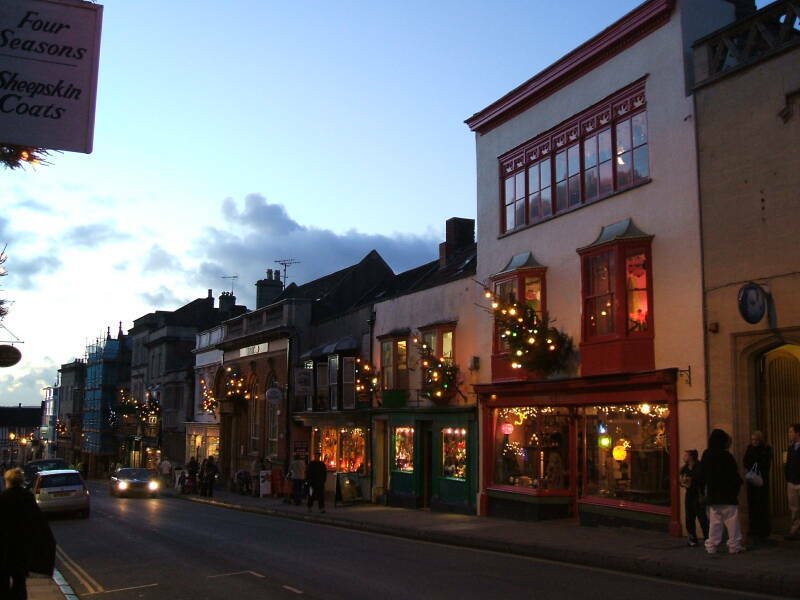 The main streets through Glastonbury are Magdelene Street, running north to the Market Place, then turning to the right and running east as the High Street. Note for English speakers from the colonies: "High Street" is how the locals say "Main Street". Not necessarily as a formal name, possibly as a general term as in "the high street used to be a cattle path." 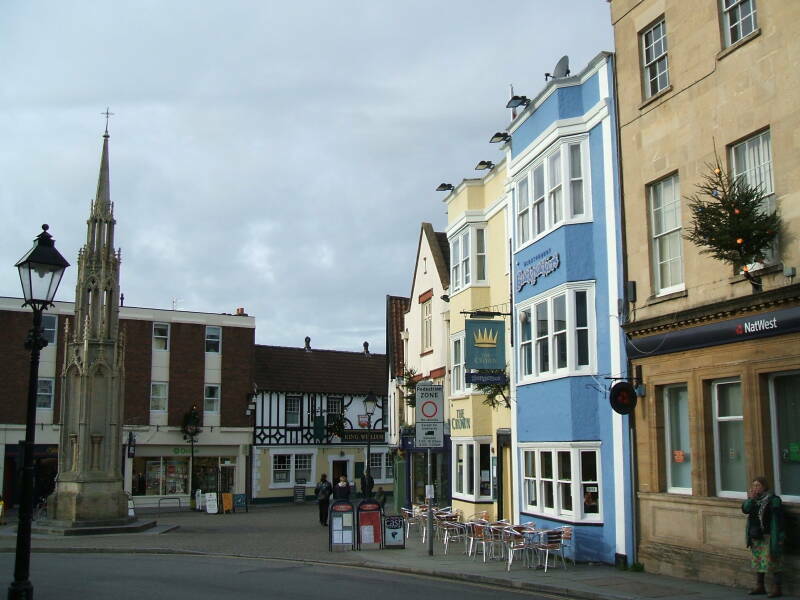 Many of the buildings surrounding the Market Place date from when the abbey was prospering, although their exteriors have been modernized during the intervening centuries. 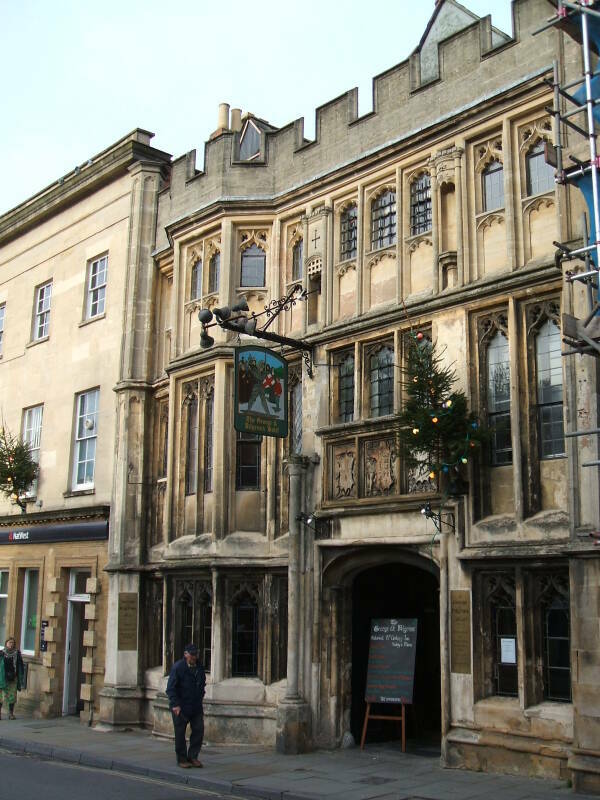 The Crown Inn, now housing the Backpackers hostel, The Loft restaurant and the Crown Bar, was mentioned in 1535. After a bad fire 100 years ago little remains of the medieval original. What survives is the bay windowed building with yellow and blue fronts seen below. 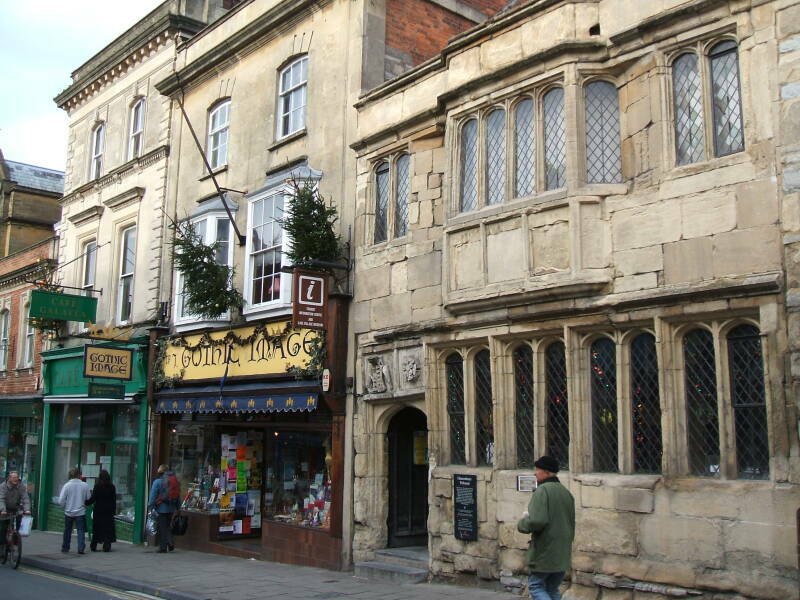 The George Hotel and Pilgrims Inn was built by Abbot Selwood about 1465 to accommodate visitors to the abbey. 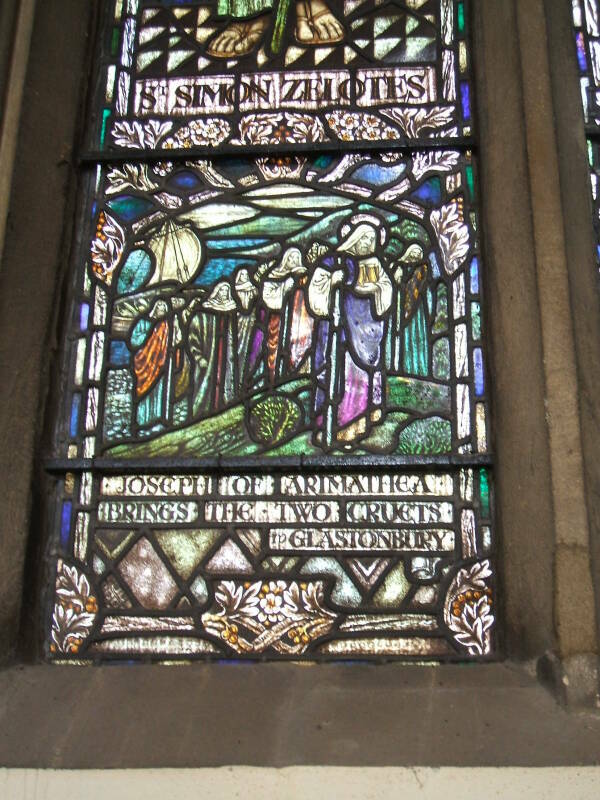 The town of Glastonbury existed to support the abbey when it was prospering. The three panels above the doorway are carved with the arms of the Abbey and of Edward IV. The town was known by the Anglo-Saxon name Glestingaburg when it was first mentioned in records in the 7th and early 8th centuries. It supposedly was known by the old Celtic name Ynys Witrin or Ineswitrin, ynys meaning "island" as this would have been when the Somerset Levels were largely flooded. The George Hotel and Pilgrims Inn now houses a pub on the ground floor and operates a hotel on the upper floors. The Tribunal was built about 1400 with a later front added onto it about 1500 using material salvaged from other buildings. It was used for trials and meetings of the sheriffs and justices of the peace. Later it became a merchant's house. Now it's the TIC, the Tourist Information Centre. 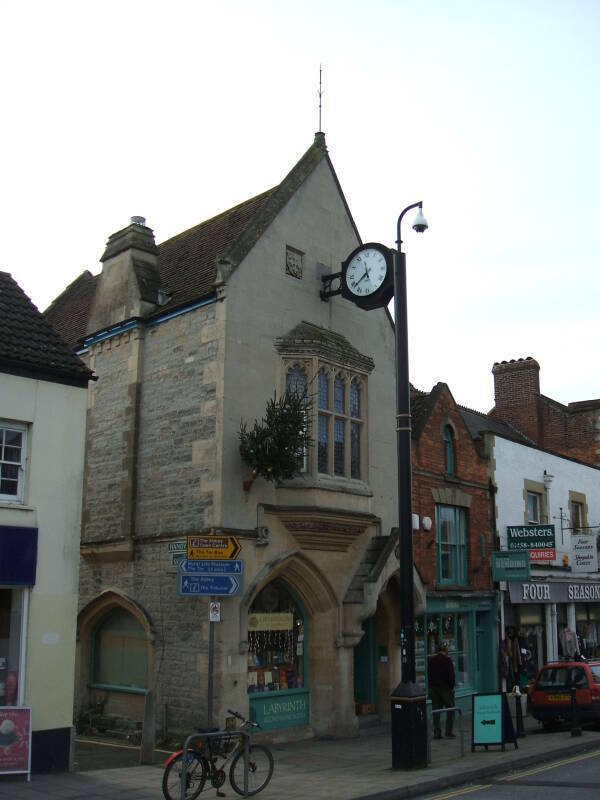 The cross in the Market Place was built in 1845. It replaced a medieval water conduit and cross surrounded by a market shelter built in the early 1600s. Below is the view out the window of my room at the Backpackers, upstairs in the old Crown building. 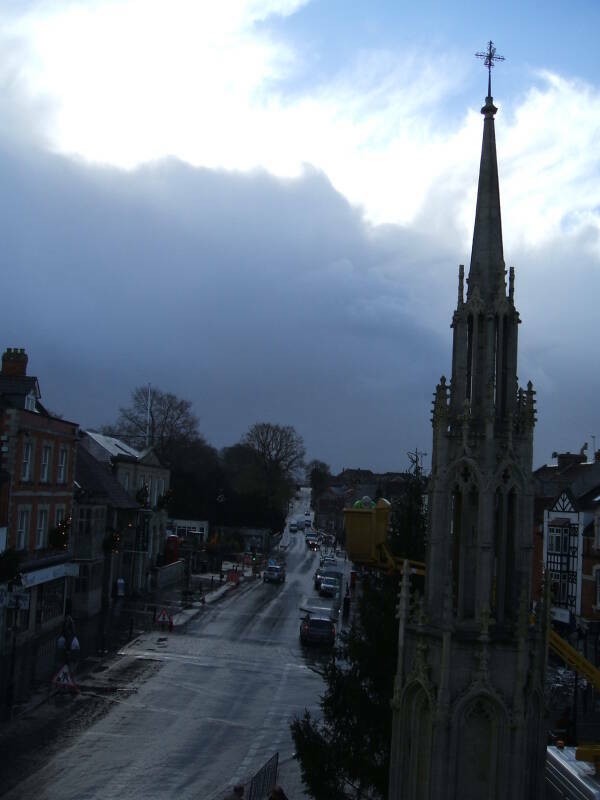 We're looking south along Magdalene Street. 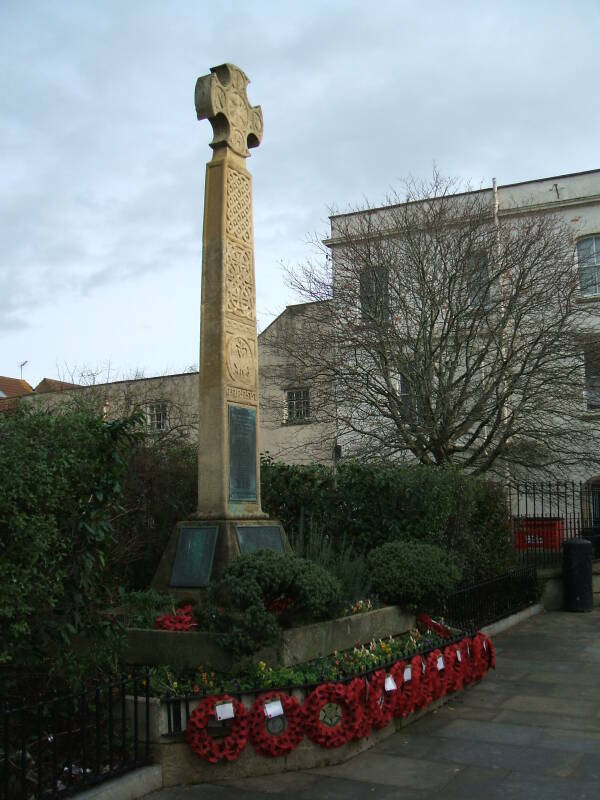 The current Market cross was built in the Jacobean era, the early 1600s reign of King James VI of Scotland who also inherited the crown of England as James I in 1603. It was a great time for science and literature. Francis Bacon was moving science toward an honest academic endeavor rather than accepting authoritarian church descriptions of the universe. Some of Shakespeare's more prominent plays were written during this period, and Homer's Iliad and Odyssey were first translated into English verse. On the down side, the dreadful scourge of tobacco appeared from the North American colonies. James I published A Counterblaste to Tobacco in 1604 but it had no real effect on the quickly addicted English people who continued "this vile custome of Tobacco taking". London had 7000 tobacconists and smoking houses by 1612. The book stores and other shops along the High Street are fascinating. 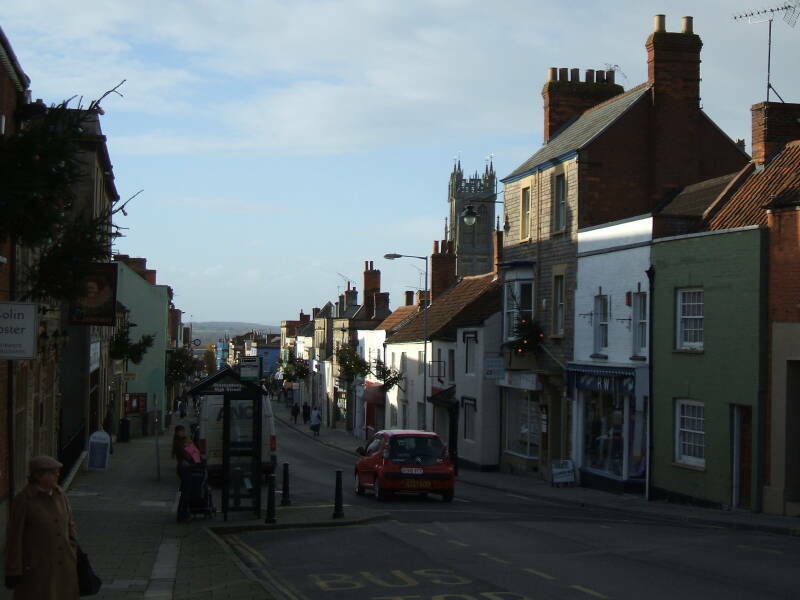 Here we're looking down the High Street from near its top end, past Saint John's Church toward the Market Place in the distance. 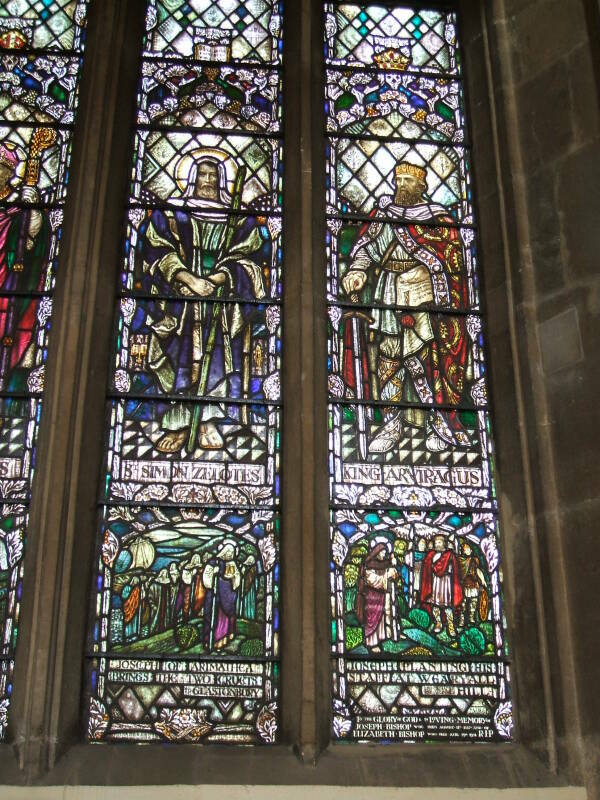 Start with the most detailed versions of the legends of Joseph of Arimathea and King Arthur's court, including all their most recent accretions and elaborations. Connect them to the Sumerians, the Freemasons and the Druids. Include the people from Atlantis, Lemuria and other places hard to find on typical maps. Throw in ancient aliens, modern seers and shamans, neo-wiccans, crystals, ley lines, polar shifts and other catastrophism, and more. No theory is so wild that it can't have its own collection of books describing it and attempting its improvement through stirring in further outright invention. And all those books are available along the High Street. None of this is a new trend. Antiquarianism and mysticism grew here through the 19th and 20th centuries. The Glastonbury Festival of Performing Arts was founded in 1970 and now is the world's largest open-air music and performing arts festival. 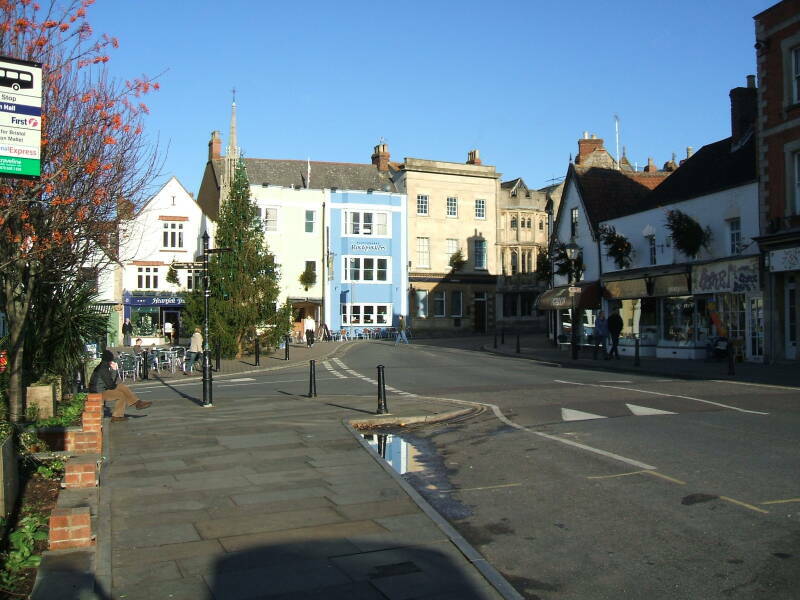 It's not held in Glastonbury itself, but about six miles to the east. Saint John's Church is around the middle of the High Street. The earliest church on this site was founded around 950, possibly by Saint Dunstan. It was dedicated to John the Baptist. A later building was erected around 1100 AD, forming the core of what you see today. The north transept was added about 1200. Additions continued over the following four centuries. The central tower collapsed about 1400, starting close to a century of rebuilding. The porch was built in 1428. The present 134.5-foot or 44.4-meter tower was built in 1475. 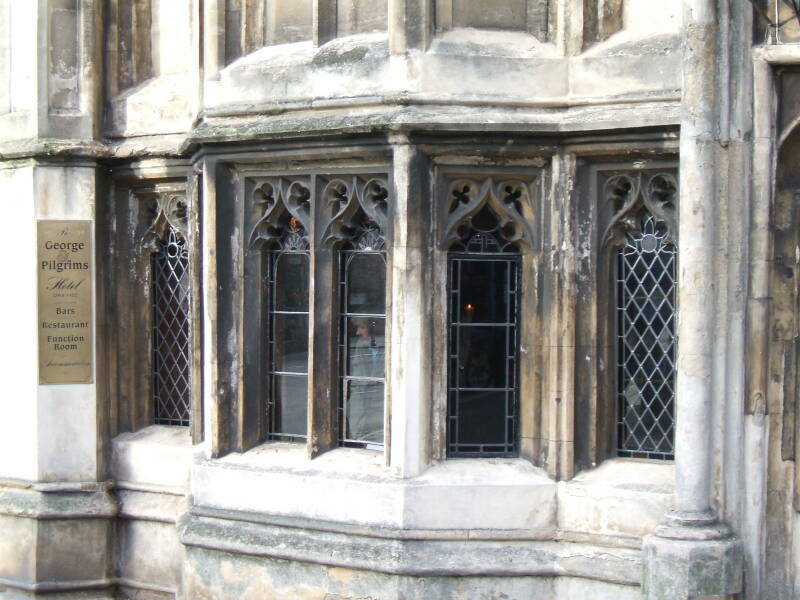 The parvis room was added above the porch in 1484, completing the 15th century rebuilding period. Saint John's Church was seized by the English crown when Glastonbury Abbey was dissolved in 1539. 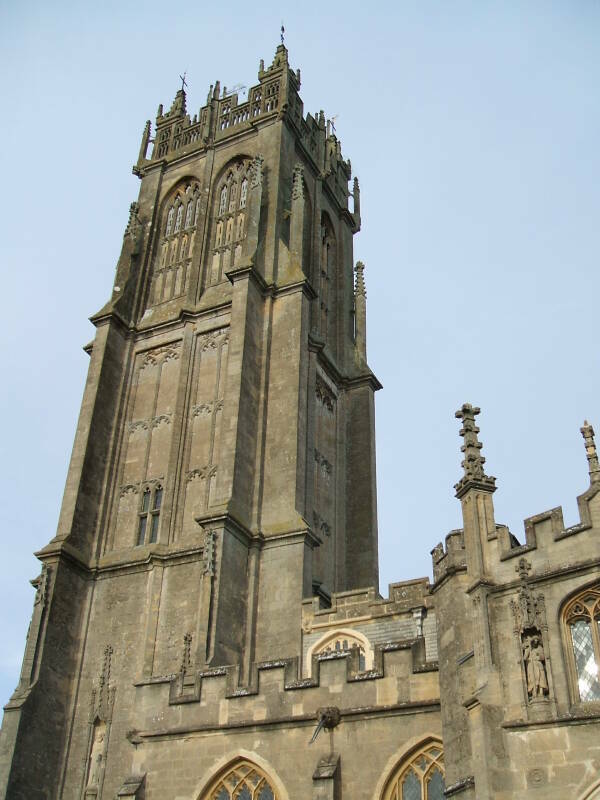 The church passed to the Bishop of Bath and Wells in 1649. In 1856 the church was refurbished. The Medieval and Georgian furnishings were removed. 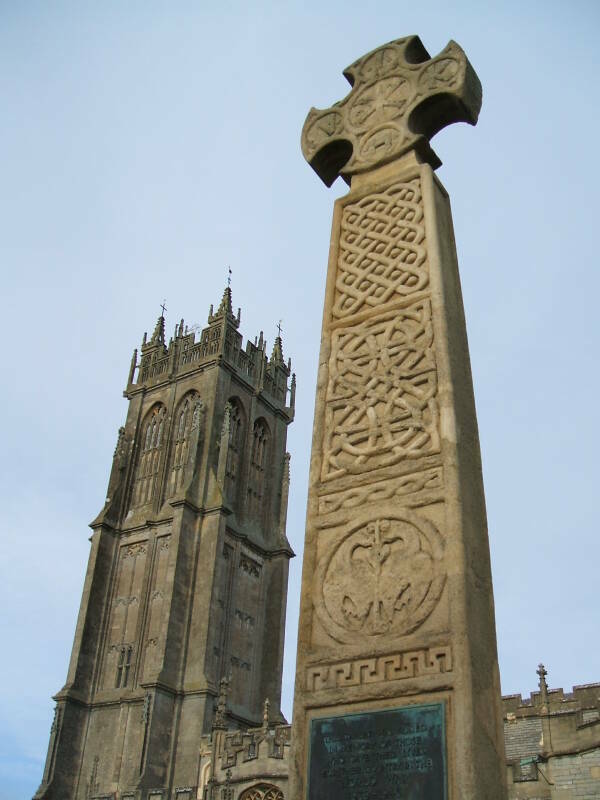 A celtic style cross and pillar can excite those visitors looking for further details of how Merlin, a founder of Druidism and a Thirty-Fourth Degree Rotarian, drove the snakes out of Ireland and the bats into Britain. The church is of the standard cruciform plan, although of course on a much smaller scale than the great church of the abbey. A row of seven celestory windows up high bring in light. 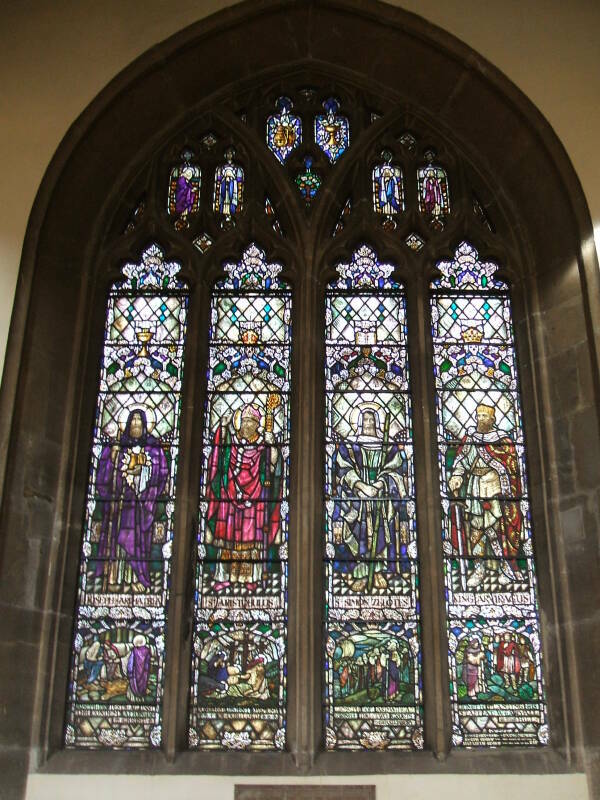 This large lower stained glass window was installed in the early 20th century, some time after 1914 according to its dedication. 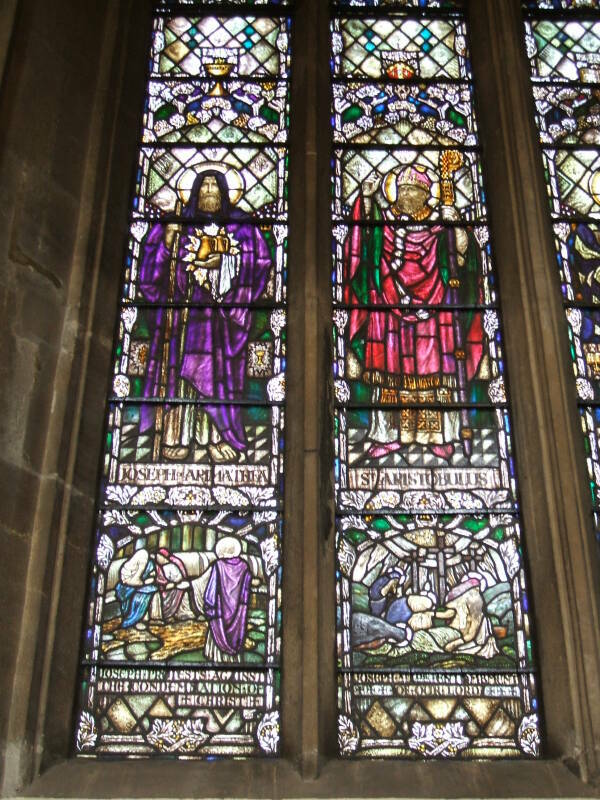 It depicts Joseph of Arimathea, Saint Aristobulus, Simon the Zealot, and King Arviragus. The Orthodox church says that he preached and died peacefully in Roman controlled Britain. He was a brother to the disciple Barnabas, and along with his brother accompanied Paul on some of his journeys. The Roman Catholic church, on the other hand, describes a typically gruesome martyrdom for him. Simon the Zealot is one of the most obscure of Jesus' disciples. He appears in a few lists and that's about it. He was one of two disciples named Simon, and to distinguish him from the much more prominent Simon-called-Peter he is called καναναιος or kananaios and ζελοτες or zelotes, both deriving from the Hebrew term qana meaning "zealous". There isn't much at all about him in the Bible, but later traditions have added details of his travels. As to where he went, it depends on which traditions you use. Mauritania in Africa, Persia and Armenia, and even Muslim tradition and Qur'anic commentary lists him as one of Jesus' "helpers to the work of God" and speaks of him preaching to the Berber people of northwestern Africa. Of course, Glastonbury is another supposed destination. He's holding a wooden staff here, but many depictions have him holding a large saw as tradition says he was martyred by being cut in half with a saw. Arviragus or Arvirargus is a legendary British king of the 1st century AD who might have been a real, historical person. Geoffrey of Monmouth's 1138 Historia Regum Britanniae or History of the Kings of Britain described Arviragus as a British contemporary of the Roman Emperor Claudius, who ruled 41-54 AD. Geoffrey describes him as succeeding to the throne of Britain (or at least a southern part of it) after his elder brother died fighting the invading Romans led by Claudius. He learns that the Romans under Claudius and his commander Hamo have fled into the woods, and pursues the Roman forces to the southern coast. Claudius gets away but Arviragus' men kill Hamo as he is attempting to flee by ship. 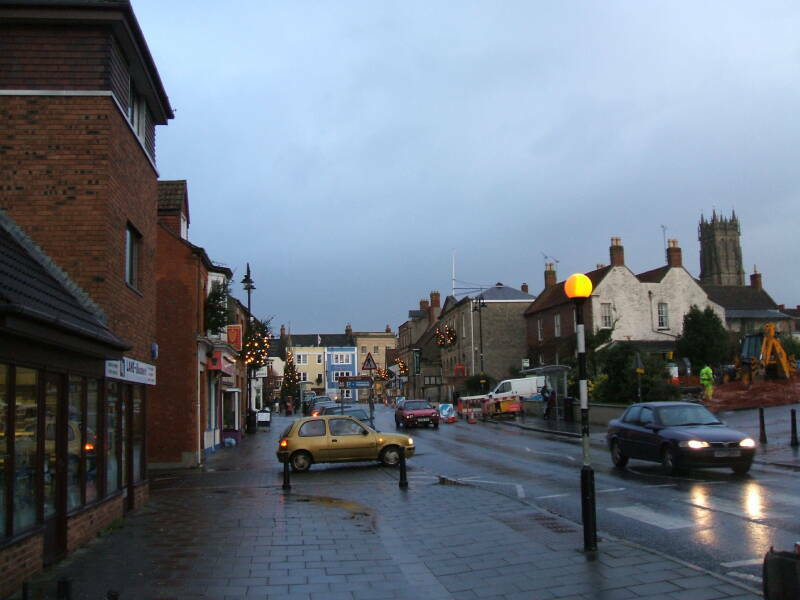 Arviragus seeks refuge at Winchester, but Claudius first besieges and captures Portchester and then attacks Winchester. The Britons break the siege and Claudius offers a treaty: in exchange for Claudius' daughter Genvissa, Arviragus will quit fighting and pay tribute to Rome. They agree, and the suddenly friendly Claudius and Arviragus head north to subdue the Orkney Islands together. Arviragus marries Genvissa, Claudius goes back to Rome, and all is peaceful for a while as Arviragus rebuilds the cities ruined in the recent war. This threatens the kings of the other parts of Britain, and the increasing tension ends Arviragus' tribute payments to Rome. Claudius sends Vespasian with an army. There's some fighting, peace is brokered by Genvissa, Vespasian goes back to Rome and all is calm again. Or so Geoffrey's story goes. Finally, Joseph of Arimathea in his purple cloak. He is mentioned in all four canonical Gospels in ways that imply he is wealthy or influential. He seems to be a follower of Jesus, but perhaps covertly as he may be a member of the Sanhedrin. He is consistently described as having donated his own prepared tomb for the burial of Jesus. 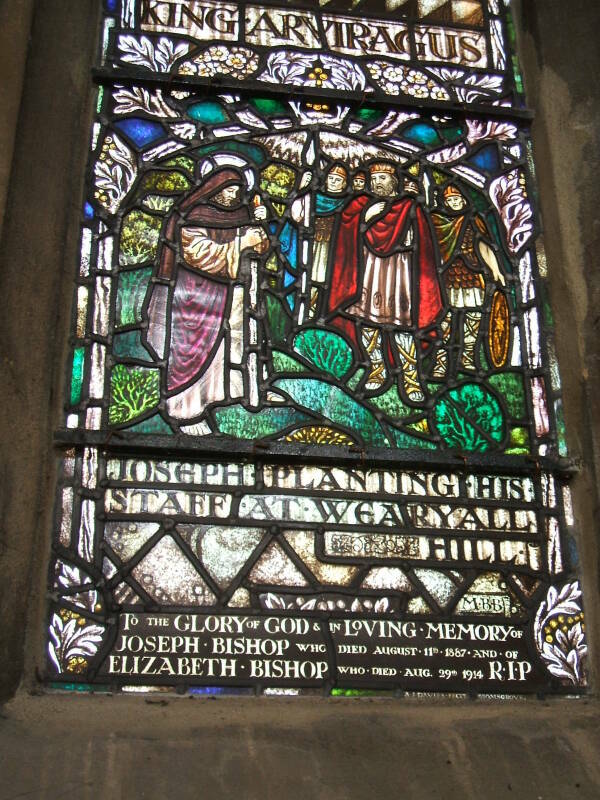 The Glastonbury legends about him fork off in the Middle Ages and have had further details added starting in the 1800s. The more recent legends say that he brought the Holy Grail to Glastonbury, whatever that might have been. A simple cup? A plate? A magical rock? 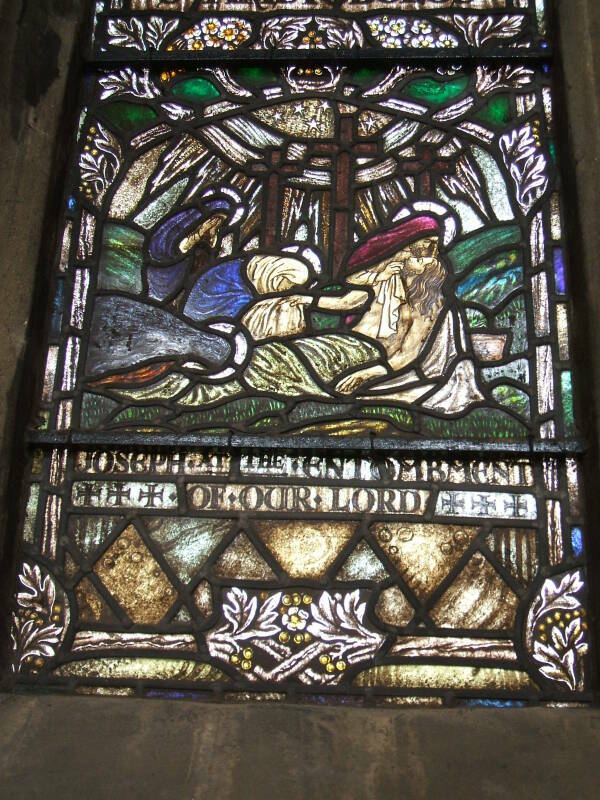 Mary Magdalene and her womb? He also had the two Holy Cruets containing the Blood of Christ and the Sweat of Christ, collected during the crucifixion. You see him carrying them in the window shown at right. Plus, possibly, the nails used for the crucifixion, the Crown of Thorns, and several hundred board feet of the One True Cross. It's implied is that his wooden walking staff was cut from the hawthorn tree that was the source of the Crown of Thorns, but he may have also brought that relic itself. When Joseph and his entourage landed on the then-island of Wearyall Hill, he stuck his staff into the ground and it immediately blossomed and took root. I suppose that's Arviragus watching him, the period is about right and the red cloak matches his depiction above. 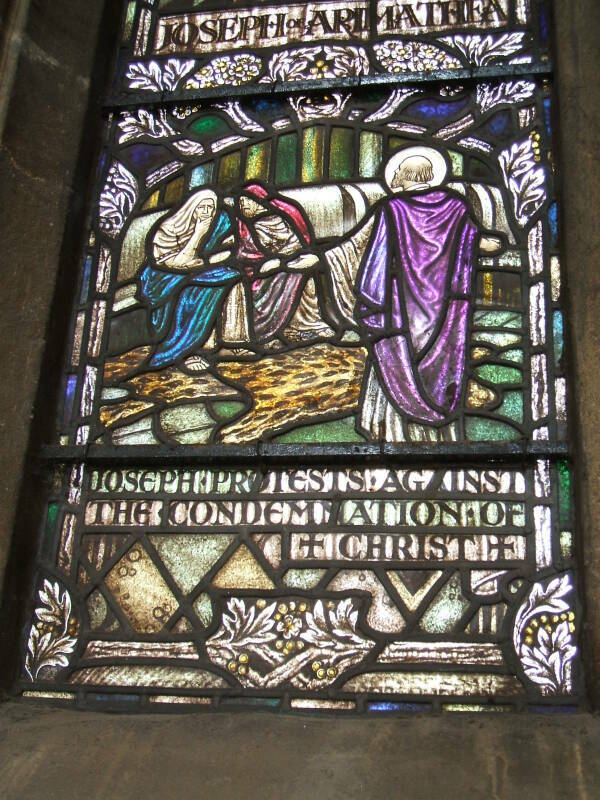 Then Joseph of Arimathea got to work in Glastonbury, first building that mud-and-wattle chapel. Or maybe just touching up the sturdy wooden chapel he had built with his nephew Jesus twenty or so years before. He hid the Grail and the Cruets and the Nails somewhere, possibly putting them down the Chalice Well. Although if the Holy Grail is really Mary Magdalene, he surely didn't shove her down the well. So that's Glastonbury and its many complicated legends. You may have come into this in the middle or near the end, so you can use the table of contents at the right to jump back into the story.